I’m going to spend a decent amount of time talking about this interesting movie. But first, I have a confession. My name is John Lincoln and I look like Seth Rogen. This is not a brag. This is not a ‘claim to fame’. It is also, sadly, a legitimate statement. My students called me Mr. Rogen all through student teaching. I’ve had beers bought for me by drunk guys who “want to buy Seth Rogen a drink.” I’ve been stopped in airports. Working at a movie theater, I hear “Hey has anyone ever told you that you like…” at least three or four times a week. It is a curse. I only bring this up because it feels good to get it off my chest. I haven’t seen a Seth Rogen movie in several years, and this seemed like the opportune time. Hopefully we can all move on with our lives. I watched 50/50 (2011) on 1.20.14. It was my first viewing of the film. 50/50 is loosely based on the experiences of scriptwriter Will Reiser as he fought a battle with cancer. His proxy is Adam (Joseph Gordon-Levitt). The best friend, both in real life and in the movie is Seth Rogen. It was Rogen who encouraged Resier to write the screenplay, so he sort of plays himself here as Kyle. As the film starts, Adam is in a nice, if uninspiring, relationship with Rachael (Bryce Dallas Howard). When he learns of the tumor on his spine, Rachael agrees to stay with him and try and help him through it. This is important because Kyle seems more interested in using the story to score girls, and Adam’s parents (Anjelica Huston and Serge Houde) are an overprotective hovercraft and an Alzheimer’s patient, respectively. Adam’s is referred to a young doctoral candidate for therapy. This is Katherine (Anna Kendrick), a young woman who has a lot of knowledge but not a lot of experience. Her youth seems to work against her as she dispenses decent advice which is met with skepticism by Adam. The last two characters we get to know are Mitch (Matt Frewer) and Alan (Philip Baker Hall) who are older cancer patients who regularly have their chemo sessions scheduled at the same time as Adam. The list above represents everyone we get to know. This is a character driven film which focuses on the relationships and fears of these folks. 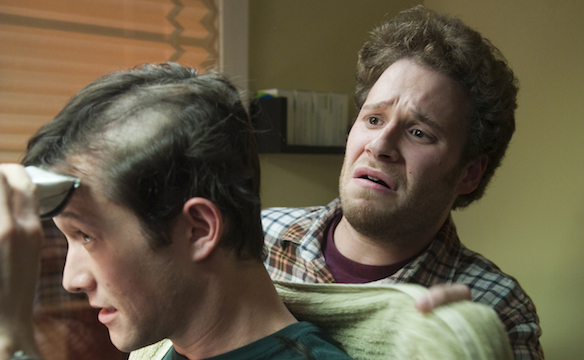 As a comedy, it works with a biting wit, plenty of self-depreciation, and Rogen’s ability to sell a goofy scenario. As a drama, it works even better. None of these characters are the ideal version of themselves. Adam never stands up for himself. Kathrine is inexperienced. Rachael is overwhelmed. Kyle is self-involved. People regularly look like jerks in this movie, but we like them because it feels human rather than mean. A scene of redemption for Kyle, in a movie like this, would normally be some big dramatic encounter. Instead, the moments are small, subtle. Adam picks up a book in his bathroom about cancer and realizes that Kyle has been carefully reading it, highlighting the pages and taking notes. The next day Kyle gives Adam a ride for an important appointment. This is as underplayed a possible. Real. It’s a nice choice by Director Jonathan Levine. If there is a weakness, it is that this movie plays out as you would expect in terms of scene selection. The conflicts we think will be there are set up in an obvious way and the payoffs are what we expect. The only mystery in the film seems to be which end of the 50/50 line Adam will fall on, but the structure of the relationship between Adam and Katherine give it away because the payoff moment never comes before a critical juncture. Yet, even if the scenarios are predictable, the handling of the scenes is top notch. A break up ends with Adam, Rachael, and Kyle all looking like bad people. Adam is the victim here, to be sure, but Kyle manages to make Rachael empathetic which makes Kyle look bad for taking the side he does. It’s carefully considered. It’s messy. It’s what it needs to be dramatically while being truly funny at the same time. It is scene like this which make the connection to these characters to easy to grasp for an audience. We see ourselves in their messiness. Rogen, particularly, shows a surprising lack of ego by playing a character modeled on himself that is so clearly self-absorbed. This is a surprisingly gentle film for as crass as it can be. It further solidifies the ability of Gordon-Levitt as a lead actor. Having seen some scenes from DON JON it is clear how deftly he can tackle any sort of role. 50/50 is a film worth seeing. The soundtrack in this movie earns a bonus point not only for song selection, but also for song placement. ~ by johnlink00 on January 21, 2014. Good review John. My favorite from 2011 as it did everything a good movie could do (laugh, cry, happy, sad, smile, full of joy, upset), and did it all in a matter of an-hour-and-a-half. Pretty successful if you ask me. Absolutely. It might have been light on surprises, but the movie didn’t really need that. I’m glad I finally saw it. I have always intended to watch this and then never managed to do so. Maybe, with this reminder, I’ll finally remember. Really worth it. I have thought about this movie several times since I saw it. It sticks with you.